Genre saturation seems to come in waves on iOS, and Multiplayer Online Battle Arenas (MOBAs) appear to be the latest game type to get a bunch of high profile titles in a short period of time. The Witcher Battle Arena (Free) is the latest such title to grace the App Store, bringing the CD Projekt RED’s fantasy world to iOS in some small fashion. While Battle Arena does a decent job in providing a comprehensive MOBA experience, the gameplay itself just isn’t compelling enough at this point to be worth an investment. Like most MOBAs, Battle Arena does a decent of providing a fair amount of extra content. Each hero has its share of custom skins (both for the heroes themselves as well as the weapons they wield). Players can also purchase extra inventory pages for the plethora of items that are rewarded to players after matches. Beyond outfitting you heroes with the equipment that can be earned, players can also fine-tune the stats of each hero, with greater customizability coming with the higher that character’s level. While there’s a fair amount of heroes available for purchase, Battle Arena only makes three available at a time for its free rotation, which feels incredibly limited. 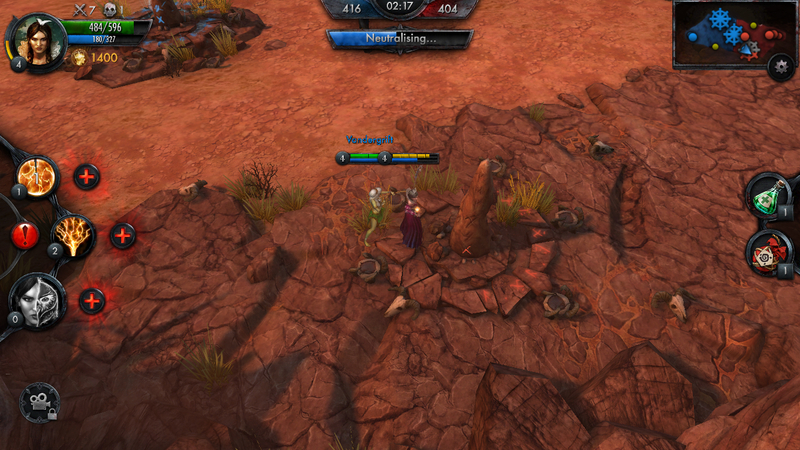 Gameplay-wise, Battle Arena is about as simple as a MOBA can get. There are no lanes, jungles or creeps to speak of. Instead Battle Arena has your team of three competing against the opposition to capture and hold three checkpoints. Each team starts with 500 tickets and capturing checkpoints causes your opponent to lose tickets at a faster pace than your team. Thus, the objective is simple, hold the checkpoints longer than your opposition until one team loses all their points. Obviously killing the opposition will aid in doing this, but Battle Arena seems to award team-based objective gameplay more than mindless ganking. While there’s only one gameplay mode at this point, there are plenty of options as to who to play against. PvP, Co-op against varying difficulties, and Practice modes all award currency and experience in some form or fashion, which I appreciated. Unfortunately, beyond the customization and options available in Battle Arena, there’s very little else I enjoyed about the game. The gameplay itself is lackluster, with hero abilities and attacks feeling very slow and inaccurate. The game lacks a good in-game tutorial mode, instead recommending that players view an external YouTube video to get even the basic concepts. Meanwhile menus, shops, and character pages felt cramped and unintuitive on the iPhone. In addition, I encountered numerous instances of server downtime. Even starting the game takes an inordinate amount of time, which sounds like a small complaint until one realizes that being able to get into game at a relatively quickly pace is quite important on a mobile device. Most importantly, I just didn’t feel engaged in the game’s battles. The game’s current maps and objectives leave little in terms of strategy other than to gang up on the opposition and hope for the best. An in-game shop is available to spend coin you earn on match-only upgrades, but it’s so out of the way it feels like you can really only visit it upon death (removing some of the minimal strategy). Death itself doesn’t feel impactful, as players revive relatively quickly. Despite the fact that Battle Arena touts the fact that its matches only take on average 10 minutes, each round still felt like an eternity. to me. I think this has to do with the overall slow pace of each hero combined with the lack of precision (and persistent latency) involved with controlling your avatar. The whole experience just feels uninspired at this point. 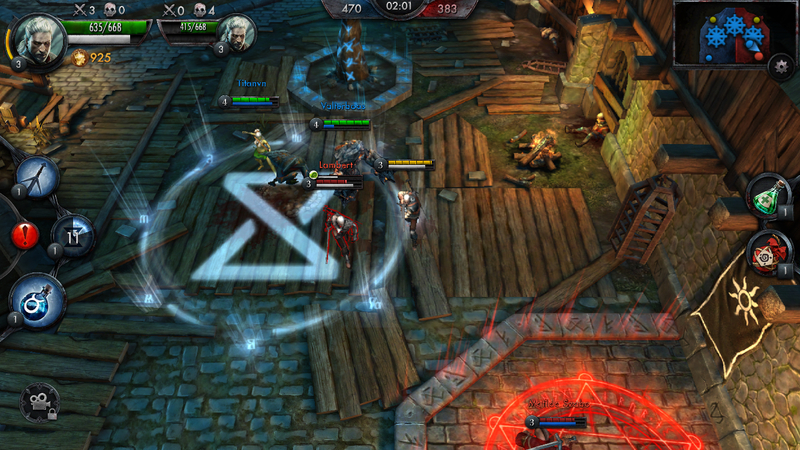 Basic gameplay combined with lackluster design elements lead to a MOBA that just can’t compete at this point with the current heavyweights available on iOS. New modes and heroes have been promised in the future, but I’m not sure if those aspects alone can really fix the slow gameplay, which I believe is the significant detraction. Like most MOBAs, The Witcher Battle Arena is free to play, so of course you’re free to check it out on your own accord. However, I just don’t think it’s worth your time at this point.